Biochemistry is the study of the structure, composition, and chemical reactions of substances in living systems. Biochemistry emerged as a separate discipline when scientists combined biology with organic, inorganic, or physical chemistry and began to study such topics as how living things obtain energy from food, the chemical basis of heredity, and what fundamental changes occur in disease. Biochemistry includes the sciences of molecular biology; immunochemistry; neurochemistry; and bioinorganic, bioorganic, and biophysical chemistry. With the broad definition of biochemistry, it is obvious that a blog cannot do human milk justice, but I do have some points to share. I have been fascinated with this topic since I began my work in lactation. In fact, one of my early projects was creating a visual that would allow parents to see in a snap shot how unique breast milk is. I had seen a list of basic ingredients found in breast milk compared to those in artificial human milk (formula). I commenced to build a 3D image of my understanding and the “Lego Stack or Brick Building Block” emerged from my work. I invented this tool back in 2001 and it has traveled across the US and is used in California WIC instructional material. I am including a picture of the handout that accompanies the curriculum here, but the idea is to use a set of large building blocks (or duplo legos) and place one “ingredient” on top of the other as the properties of the ingredients are discussed. 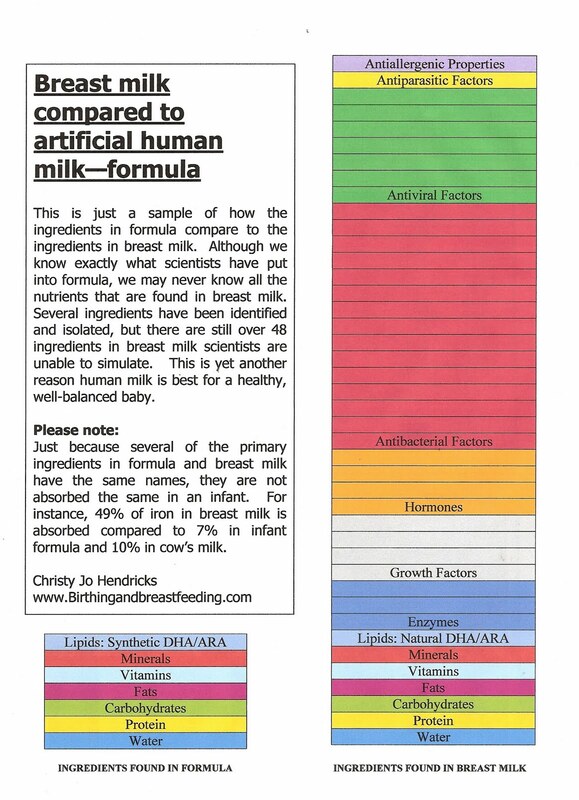 At the end of the demo, the breast milk stack dwarfs the formula stack. It leaves quite the impression. Since I created this simple illustration, I have learned so much more about breast milk’s composition. I wish I could share my entire PowerPoint on Human Milk for Human Babies, but I will do my best to highlight some of the information. One main point is that human milk is species-specific. Just a comparison of different mammals and their milk composition verifies this statement. If we were to be fair and pick the mammal whose milk has many of the same ingredient percentages as humans, we would most likely be giving our infants donkey or cat milk. I can’t imagine having cat farms of lactating felines to feed our infants, but really, what’s the difference between that and cattle farms? Just a little regression to point out the humor in our loyalty to cow’s milk formula. Breast milk, unlike formula is a living organism. When one looks at breast milk under a microscope there is plenty of movement. Contrast that with formula, where the Petri-dish reveals a stagnant state. Formula is dead. It cannot change to meet the needs of a particular infant. It does not change during a feed. In fact, the first drop given to an infant at day one is mirrored in the last drop he receives at one year. Formula companies are now trying to market this change by creating “stage formulas”, another gimmick for marketing. (I recently saw a formula ad that stated, “now, one step closer to breastmilk.” Here is a way to put that claim in perspective, stand at attention, move one step to the right and then declare, “I am now one step closer to China”–not anywhere near China, mind you, but able to make an honest statement, providing your geography is correct. We have to all be aware of the claims marketing experts are making and be ready to expose the propaganda being used). There are many articles that are well cited available for purchase. These are the scholarly articles that appeal to the medical professionals and are written in journal language. Colostrum is high in protein, fat-soluble vitamins (A and E), minerals, and immunoglobulin. (Antibodies that pass from the mother to the baby and provide passive immunity for the baby. Passive immunity protects the baby from a wide variety of bacterial and viral illnesses). Two to four days after birth, colostrums will be replaced by transitional milk in the full-term infant. Transitional milk occurs after colostrum and lasts for approximately two weeks. The content of transitional milk includes high levels of fat, lactose, water-soluble vitamins, and contains more calories than colostrum. Mature milk is the final milk that is produced. 85-90% is water, which is necessary to maintain hydration of the infant. The other 10-15% is comprised of carbohydrates, proteins, and fats which are necessary for both growth and energy. There are two types of mature milk: foremilk and hind-milk. There is not much iron in human milk, but infants are born with large physiologic stores (enough to last 6 months). These stores are laid down the last trimester, so if an infant went to term, there is likely enough iron to avoid any supplements. Also, infants absorb 50% of the iron found in breast milk, but only 4% of the iron in formula and cereals, so it is misleading to point out that formula has more iron since it is not readily available to the infant. Obviously, I could go on and on. In fact, more ingredients are discovered in breast milk annually. As money is put into lactation research, this list will most definitely be expounded on. I liken it to our space explorations and discoveries. I remember in elementary school learning about the Milky Way as the only galaxy and now as I study with my children I am reminded that new planets, stars, other galaxies–have all recently been discovered and what we thought was an exhaustive list of space was actually very anemic compared to recent finding through exploration. Stay tuned in to research and attends conferences where newly published information is presented. This is fascinating stuff! Humans are obviously made to breastfeed. Mom’s milk is perfect for her individual infant(s). My new tagline is, “designed to breastfeed.” Isn’t it nice when we do what we are designed to do? I recently tried to hammer a nail with a heel of my shoe–it worked, but when I used a small hammer, it was much more effective.